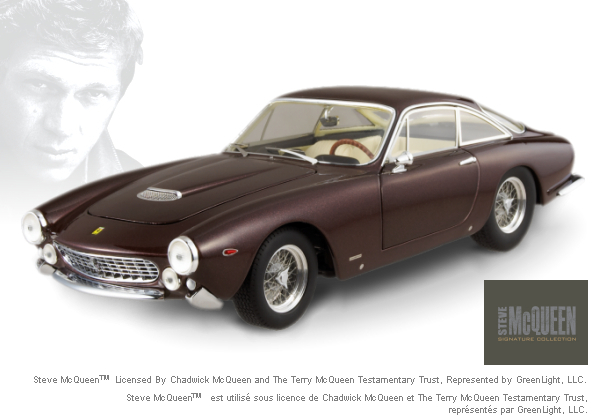 Ferrari 275 berlinetta Steve McQueen STARS COLLECTION 1/18 Scale by Hot Wheels ELITE Edition , $299.99 at Modena Motors Inc.
Ferrari Stars Collection explores the arts through the eyes of well-known fans of the Prancing Horse style and elegance. The collection offers a complete assortment devoted to the world of cinema and to Ferrari cars in memorable scenes. Don’t miss these individually numbered models reproducing the most famous Ferrari cars from blockbuster Hollywood movies! ELITE EDITION detailing and quality. Limited to only 5000 numbered pieces so when they are gone they are gone!!! SOLD OUT from Hot Wheels and all have been distributed to those who pre-ordered over a year ago so this could be your final chance! !